My recent projects have as their common denominator an investigation into collected abstract forms, patterns and structures appropriated from the real world. Product packaging, highway signage, record covers, Hardware paint charts and other seemingly ordinary or common abstract elements that surround us in our day to day existence. Of interest to me are those abstract forms that not only provoke memories of a personal experience, but also provide a shared connection to collective memory where we are all encouraged or invited to partake and claim ownership. ‘ACME Automotive Paint Project’ continues this investigation. 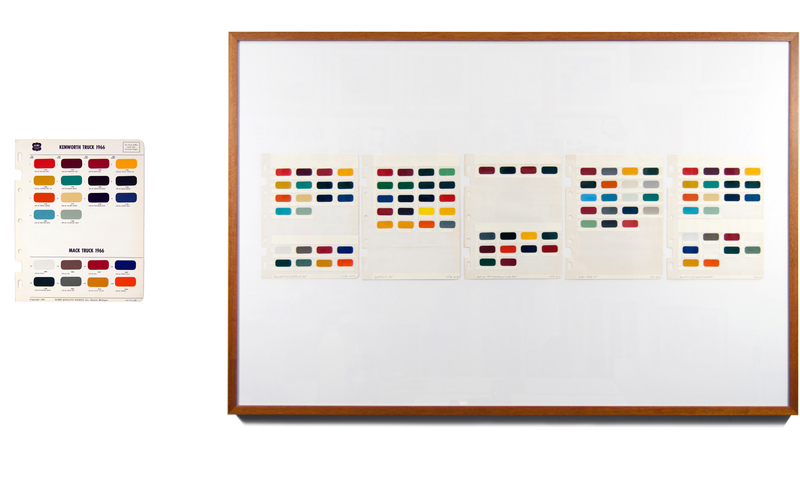 A series of original paint color charts from mid sixties Detroit have been reworked to remove all existing incidental details, leaving only the beautiful, abstract, lozenge shaped floating forms of the colour samples. The colours presented in these charts, including the deep cherry reds and ‘School Bus’ yellows, become a record and perhaps be a reminder or memory of a previous era. The Mornington Peninsula Regional Gallery’s National Works on Paper was established in 1998 and incorporated the former Spring Festival of Drawing and the Prints Acquisitive which began in 1973. National Works on Paper is one of Australia’s most prestigious awards and acquisitive exhibitions. A biennial exhibition, its role is to support and promote contemporary Australian artists working on or with paper.